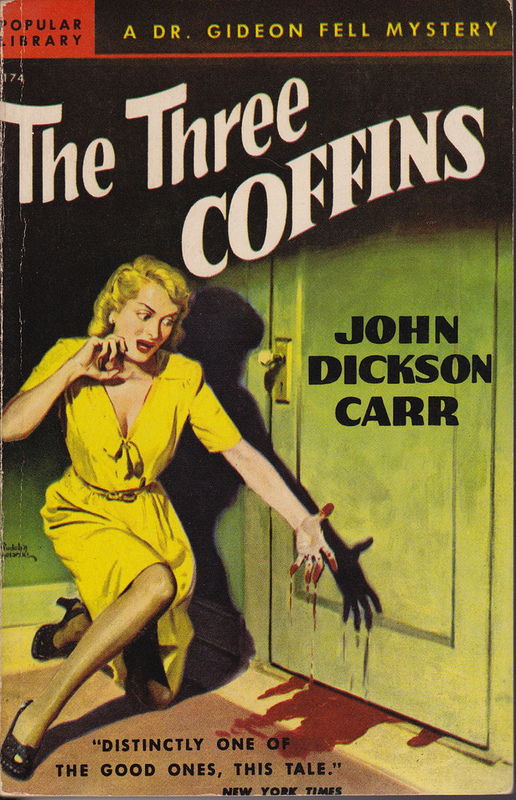 This was my first Carr and by many it’s said to be the best of his works, if not one of the best mysteries ever. Yes it is good, but (and please don’t immediately scream blasphemy) I wouldn’t call it among the best I’ve ever read. So be warned, I’m not going to write anything specific, but if you want to approach the novel untainted by ideas or notions, don’t read further. The atmosphere is great and it is very well constructed, but considering the very high ideal of justice, held by central detective Gideon Fell, I found the solution a little bit hard to swallow. Many parts of it were elements of random chance and not part of an ingenious scheme by a mastermind. At least one part of the crime was just a matter of inches instead of being carefully planned and thus I couldn’t call it properly foreshadowed. I actually solved most of the case, because there couldn’t be any other proper solution, but I never understood some of the “Hows” and when I learned them I found them to be a bit cheap. As with other Carrs I’ve read by now, the characters are well constructed, they actually create a microcosm that you can immerse yourself in, instead of creating a mere stage for the crime to play out. The atmosphere was very Gothic and dark, I was reminded a bit of Poe or some other contemporaries of Gothic fiction. So I can’t say anything against the story in itself, because there “The Hollow Man” really delivered. Still I feel my fun slightly cheapened when expecting a fair mystery and gaining some rather unfair parts. I have to say though, this is not Carr’s fault but more of a problem with his fans. This story is praised so high up into the heavens, it’s hard to appreciate it for what it is and not try to pull it back on the floor where it belongs. Not question, for the locked room study alone it is a quintessential part of compulsive reading in the field of detective fiction and mysteries, but it is not the peerless masterwork among the contemporary works that it is often made out to be. Yes, the solution has some slip-ups, but the book mainly derives its admiration from the fact that it offers an overly ingenious and highly complex solution, without the plot becoming a cluttered mess. You perfectly understand how everything went down by the end of the book, but how fair everything exactly was is another thing all together – and that’s what people marvel and gush about, the complex structure of the plot. I still admire The Hollow Man and it’s one of my favorite Carr’s, but even I have to admit that some of his other books, like He Who Whispers and She Died a Lady, are, perhaps, more successful as impossible crime novels. And if you want to read a peerless masterwork among contemporary works, look no further than John Sladek’s Black Aura, one of the finest impossible crime stories ever conceived. The main impossibility involves a mid-air levitation! Grade A stuff! Great blog by the way. It’s always great to have an opportunity to talk with fellow mystery enthusiasts. Yes, many people praise the construction of “Hollow Man” and I agree there. Still I think it spoils the aftertaste if you learn that many things were pure chance and therefore pure guesswork. Of course it was pretty good work to get to a solution in such a convulted case, but I still wonder if he couldn’t have done at least without the “fatal hit while wounded and without even aiming shooting at minimal available space” part of the whole plot. I know Carr had to dispose of that character, but this seemed just so out of the blue, but I have to admit that is personal taste. A friend of mine is reading “He Who Whispers” right now (we both get them at our university library) so I will have to wait for that one.